Offroad vehicle for bush and beach access. Warning: Please note that we are West Adventure Tours, not West Comfortable, Predictable or Luxury Tours, travellers should expect adventure, challenges, longer hikes & swims and at times rough 4WD roads. This is not a bus tour. We pick up in Perth at 6am, getting out of the city nice and early our first stop is Nambung National Park, home of the Pinnacles Desert. 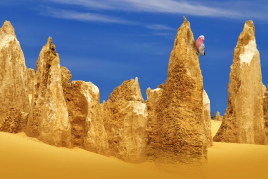 See the hundreds and hundreds of scattered pinnacles among the yellow sand take a look inside the discover centre. From here we continue our trek north to Kalbarri and explore some of the coastal cliff areas in Kalbarri National Park, hopefully we can catch the sunset here. From here we head into our private bush camp located on the Murchison River and spend the evening getting to know our fellow travelers. Our first campsite is located on private property with views of the Indian Ocean. 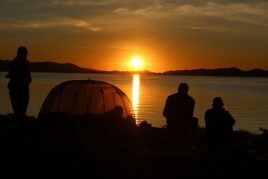 2.The beauty of bush camping is that we rise with the sun and get moving early. 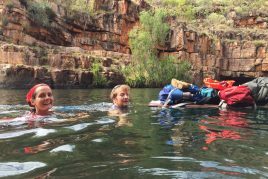 From our river camp we head back into Kalbarri National Park where we explore the inland gorges of the park including Murchison Gorge & Natures Window. 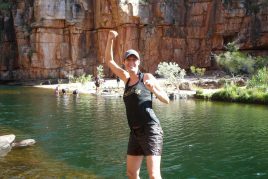 Here you will have the option to try out abseiling down one of the gorges, this is an optional activity and at own expense. From Kalbarri we head north up the Penninsula of Shark Bay, This is a World Heritage listed area and you will get to discover why. We have an awesome camp right by the waters edge, immersed in total wilderness and surrounded by nature we can soak it all up around the campfire. 3.We rise nice and early and head for Monkey Mia this morning, (“”just up the road”” as we like to say), arriving at Monkey Mia we spend some quality time with the Dolphins and participate in a feeding session. Arriving in Monkey Mia we meet the local dolphins and join in for the dolphin expedition. This involves stepping into the waters edge and listening to the story and information about the dolphins. The dolphins will be fed a few fish and selected people are chosen from the crowd to feed them. This could be you! Make sure to have your camera with you. Wild dolphins have been visiting the shoreline at Monkey Mia virtually every day for over 40 years. In the afternoon we say goodbye to Coral Bay and further up the peninsula towards Exmouth spending the night in Yardie Creek amongst Cape Range National Park at our camp. 5.Today in Exmouth we spend the time in Cape Range National Park and surroundings. From exploring the limestone cliffs for a hike we can also swim and snorkel in the beaches where the Ningaloo Reef comes right up to the shore. This is one incredible place to visit and the beaches are stunning, Turquoise Bay is voted one of the best in the world. If lucky, you might spot some turtles, dolphins and more. 6.Today we need to get some Km’s in the bank as we start to head south again back to Perth, We will stop in Carnarvon for a stretch, have some lunch and even a possible swim. 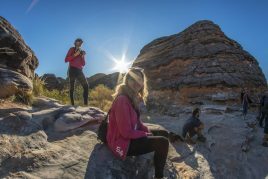 Tonight is our last night of camping in the area of Kalbarri, sit back, relax and reflect on the past week with your new friends. 7.On our last day of the tour we will have some fun and stop into the small holiday and fishing town of Lancelin and try out some sandboarding in the awesome white sand dunes. Give it a go, or just climb up the sand dunes and check out the view and make sand angels. (This is our only option instead of snow over here in Western Australia) from here we are just a couple of hours away from finishing the tour back in Perth this evening and we will drop you back to your hotel so you can have a good shower after the week of camping and remove the sand that will be everywhere!